It is possible that the hottest seasonal competition will be held already on Saturday, July 28, at Kandavas Kartodroms. 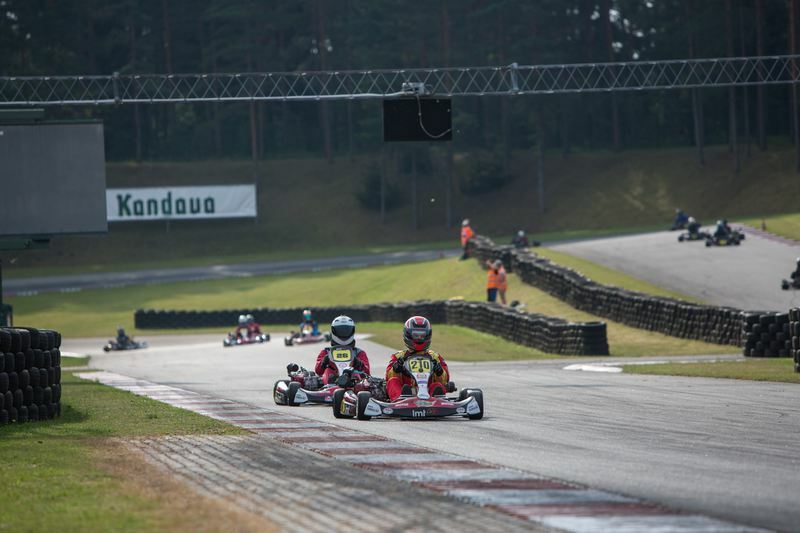 On the starting line, the Latvian Karting Open Championship, the Pro-Kart Cup, the Rotax Challenge Cup, and the test of the LMT Autosport Academy will pass. Competitions are definitely promising to be hot, as this will be the mid-season stage, indicating that more than half of the race is already behind us. Also, the weather forecast for the holidays does not let us cool, which is nice, but of course, there are also shadow sides for it. We welcome all participants, as well as visitors, to be as cautious as possible from direct sun rays, as well as to take care of a sufficient amount of water in the body! We are responsible for our health so that we can enjoy great holiday and competition. News for electrokarting or TeK class. From this stage, it is possible to use narrower but even tougher tires VEGA LL99. It should be noted that it should be that these tires are much more suitable for the TeK class, because it reduces the rolling friction. The VEGA XH2 model for existing tires can still be used. At the moment, on the website www.prokart.lv there are general ratings for the first two seasons! Slightly about saturday's agenda. It should be noted that the registration of participants, the technical commission and the issuing of tires will take place on saturday from 8:00 - 9:00, followed by a meeting of participants. We remind you that attendance at the meeting is compulsory. Participants' venue is open on thursday 26.07. from 08:00. Places for participants are allocated only to competitors. Places are not booked in advance. The competition organizers will award them in accordance with the order in which the participants arrive on the site. Also, participation in the award ceremony is compulsory. Total planned duration of the competition 28.07. and from 8:00 to about 20:00, due to the fact that the awards ceremony is scheduled for 19:00. We remind you that the technical park - drilling in asphalt is strictly prohibited. We also want to emphasize that the Kandavas Kartodroms racing park is relatively small, while there are a lot of participants, so it is decided that in the closed park there will be plunging cars that will only held the kartings and not the pilots themselves. A request to be understandable, because it is only for the purpose of releasing the place for the competitors of their tent t.i. the technical park and sports equipment, and also the normal movement is not restricted. Road transport, which will not be required to be located in a closed park, can be placed on a car park close to the track. For this more detailed info will be available at the track staff. A bit more about organizational things that affect all competitors and teams. It's no secret that Kandava always has power supply difficulties. The organizer has taken care of this, and there will be a diesel generator available to relieve local power lines, but in any case, it can be expected that the electricity may disappear, so asking for it for the participants themselves and ensuring autonomous sources of electricity. For anyone who can not keep up with the race on the spot, we invite you to use the opportunity to do it online and on Facebook. www.prokart.lv , as well as on the internet site www.sportacentrs.com Also in the Facebook section - Pro-kart all day long will be live broadcast and the hottest news, pictures and race results in a visible form. Apart from live streaming from the competition, all the results of the race in online mode will always be found here www.results.lv. In turn, they will be published on the www.prokart.lv page under the section "Races". If you have any questions or uncertainties, please write to prokart@prokart.lv or on our Facebook page www.facebook.com. Also, a big request for all sportsmen this season - to inform about their forthcoming competitions outside Latvia and their results - Pro-Kart spokeswoman Sabīna Leingardi / e-mail: sabine.leingarde@gmail.com / 28355507 or LAF press secretaries - Kristin Pavlovsk / e-mail: prese@laf.lv / 28344187. For all we wish a successful days of working week and we will meet on saturday at Kandavas Kartodroms!